TEN7AVENUE: Food | Love at First Bite! Food | Love at First Bite! Lotus Biscoff is new to my knowledge and it says, 'every coffee needs a lotus'. I didn't mind that much since I am not a coffee drinker. But hey, I opened one Lotus Biscoff, tasted it - and puff - I found myself continuously open a pack of this biscuit! Each bite is inviting for another bite! 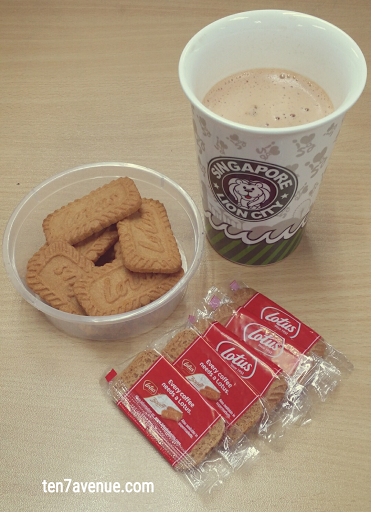 Surpringly, the Lotus Biscoff and Teh Tarik complements well! The Lotus Biscoff is a butter cookie or biscuit that is sweet with a strong subtle taste, but it is really interesting. Partnered with teh tarik, it a great way to start a day. This can be enjoyed during snack time too. With this Lotus Biscoff, I think it is a good ingredient for a dessert. Yes, I believe so and will try one soon!